Golfer Arnold Palmer participates in March of Dimes' WalkAmerica. Former King of Morocco, King Hassan II and Senator Stevens at a Foreign Relations dinner. 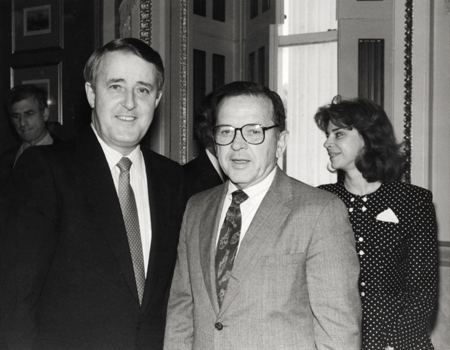 Former Canadian Prime Minister Brian Mulroney and the Senator. Astronaut Michael Collins was part of the crew of Apollo 11, the first moon landing. He stayed in orbit, as someone had to mind the ship. Senator and Ann Stevens with singer Chet Atkins at Republican Conference Dinner.